Calculated Bets: Computers, Gambling, and Mathematical Modeling to Win! 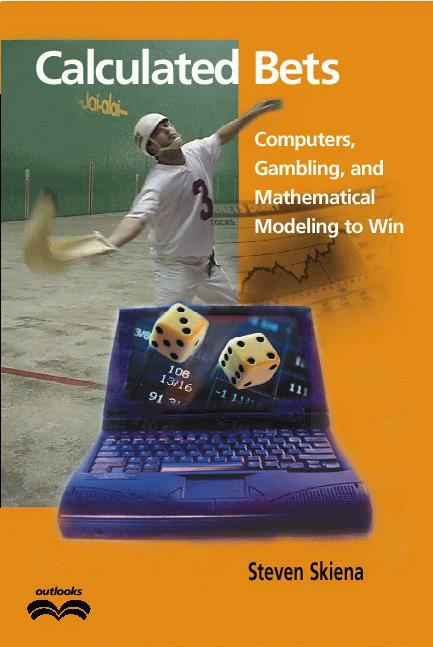 Calculated Bets: Computers, Gambling, and Mathematical Modeling to Win is copublished by Cambridge University Press and the Mathematical Association of America. 6. Is this Bum any Good? ``This funny and utterly compelling book is the story of how Skiena and his students constructed an embarrassingly successful computer program called Maven.'' -- from the full review in New Scientist by Tony Jones, author of Splitting the Second. Calculated Bets in hardcover and paperback, and in Great Britain and Germany! Links to all sites described in my book. Check out jai-alai action photos from the book. -- This union supports the interests of professional jai-alai players. Contains a variety of interesting links, including those to frontons overseas. Learn to play jai-alai at the Jai-alai Academy. International sites for jai-alai include Australia and the Philippines. Gambler's Anonymous is an international organization dedicated to helping problem gamblers. Resources on the mathematics of cardcounting in blackjack, including Thorp's book The Mathematics of Gambling. The Cambridge University Press link to Calculated Bets. The Power of Mathematical Modeling -- Mathematical models govern our economy and help forecast our weather. They predict who will win the election and decide whether your mortgage should be granted. However, the man on the street has at best a dim understanding of what mathematical models are and how they work. In this book, I use our jai-alai system to thoroughly explain how mathematical models are designed, built, and validated. The Craft of Computer Programming -- For most people, the ideas behind modern computing systems lie shrouded beneath a thick mist of buzzwords and technology. They do not understand the process by which computer programs are made to work, and the elegance and beauty which underlies the best software. In this book, I will show how my students and I built a very interesting computer program which works completely without operator intervention, even phoning in our bets for us. I use our jai-alai system to explain to the layman such computer science concepts as parsing and why the Millennium bug is hard to kill, why real programmers hate Microsoft, and the real glories of the Internet. The Joys of Jai-Alai -- Jai-alai is a spectator sport and gambling venue which is under appreciated and misunderstood by the public. I'd like to acquaint a new audience with the history and color of this fun and exciting sport; and whet the interest of current fans by making them more aware of what determines the outcome of each match. Finally, I'll tell the reader the best way to watch jai-alai, and to bet on it. The Mathematics of Money -- Gambling and mathematics have a long and interesting history together. I'll discuss other gambling systems, both successful and unsuccessful, for such games as lotto, roulette, blackjack, and Wall Street. Indeed, my jai-alai system functions very much as a stock trading system in miniature. The reader will learn how program trading systems work, the future of Internet gambling, and the real reason brokerage houses don't offer mutual funds that invest at racetracks and frontons.